N0HYD - QRP & Portable Adventures! 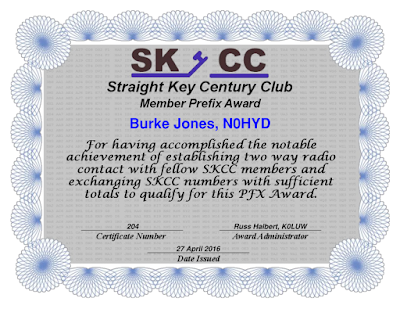 : SKCC PFX Award! 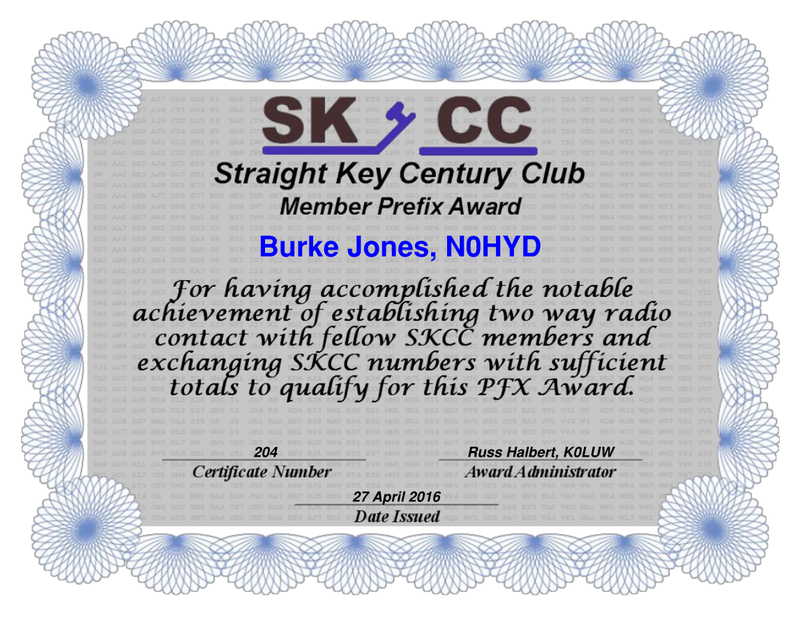 As I have been documenting on the blog I have really been having fun using a straight key and chasing other SKCC members on the band. Right now I have worked 78 members, I just need 22 more to get my Centurion award. On the way to this achievement I was able to work enough unique call prefixes to earn the PFX award. The basic way this works is that each unique call sign prefix is equal in points to their SKCC number. For example my SKCC number is 8033, so my N0 prefix would be worth 8,033 points. For this first award you need to collect 500,000 points - which I have been able to do. If you enjoy CW and want to work a bunch or really nice guys, and great operators you really need to get involved with this club. It is FREE to get involved with. Just visit http://www.skccgroup.com and get your number! Thanks Craig! I saw you had a good showing in the May WES - good job!